Little Family Fun: Build a Butterfly! One of LB's favorite preschool activities during our BUG week was this one! We have played with it several times so far and had so much fun coming up with new and beautiful butterfly designs! Some of the designs are LB's creations, and some are mine. 'Tis fun for all ages! :) Can be used as a great butterfly or bug craft, or even to teach kids colors as you mix and match! Lay out all the craft foam pieces on the floor or table and show your child how to put them together to create a beautiful butterfly. Then take them apart and start again! You might also like our awesome activity we did using the same idea to build DINOSAURS using craft foam pieces. My kids loved it. Check it out! And if you're looking for more fun ideas with a Butterfly theme, here are some ideas! You could make butterfly cookies and decorate them! 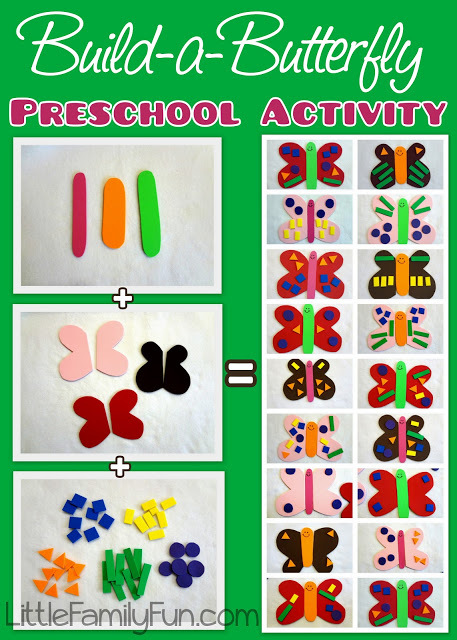 Or play this super cute butterfly sorting game! I love this! How clever and fun! This would be a wonderful addition to a butterfly unit. Pinning! This is so brilliant! Pinning!